England travel to Ellis Park for the third time on Saturday looking to halt their losing run on South African soil. England have not faced the Springboks in Johannesburg since 1984 when they lost 35-9 to a South African side inspired by Danie Gerber who crossed for a hat-trick. The pair met on the same ground 12 years earlier when it was England who took the bragging rights thanks to a 18-9 win with Alan Morley scoring their sole try. Recent history, however, will prove to be painful reading for Stuart Lancaster's side. They last won on South African soil back in 2000 when they prevailed 27-22 at Bloemfontein. It was that man Jonny Wilkinson who steered them home with all their points coming from his boot. But there could be two men in England's matchday squad for Saturday who have been part of a winning party at Ellis Park. Lee Mears and Ugo Monye were both part of the 2009 British & Irish Lions group that won 28-19 against the Boks in the third Test of the series three years ago. 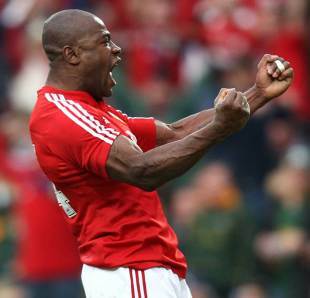 Monye was a try-scoring hero that day but Mears failed to feature in the matchday squad having started the first Test. South Africa v England all-time record: Played 32, South Africa won 20, England won 12, drawn one.